Since 2000, the Online Journalism Awards (OJAs) have honored the best in digital journalism. The range of projects participating in the awards have evolved along with available technology since the early days of the internet. What hasn’t changed is the high caliber of the work the awards recognize. After 18 years, we recently endeavored to breathe new life into the OJAs by creating unique branding and building a digital home fitting of these inspiring projects. We’re excited to walk you through the new OJA website, now permanently living at awards.journalists.org. 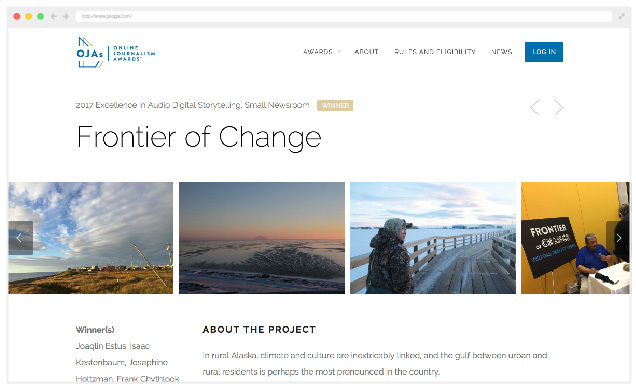 The website is not only a flagship to showcase the OJAs and OJA winners, but also serves as a resource to teach the next generation of ambitious digital journalists. Previously we posted a list of finalists to the Online News Association that was easy to browse. On the new website, you can now explore winners and finalists by category and organization. For example, all of the General Excellence finalists are in one place — and sorted by Large, Medium and Small newsroom categories. It’s also easy to see the nine times the Associated Press was a finalist, or the 14 entries from CNET. Check out the 19 categories from 2017 and the more than 500 organizations featured since 2000. Previously, we only listed the entry title, organization and an external link for each finalist. Now we’re pleased to include the journalists who worked on the project, images from the project, video embeds and a complete entry description. The descriptions often include details on how the project came about and the challenges the newsroom faced. Over all these years and across all our categories, the OJAs have recognized a total of 1,599 finalists, now all showcased on the new OJA website. Finalists from the 2015 OJAs onward now have the improved profiles with detailed descriptions. We’re working on updating other entries in the coming months. 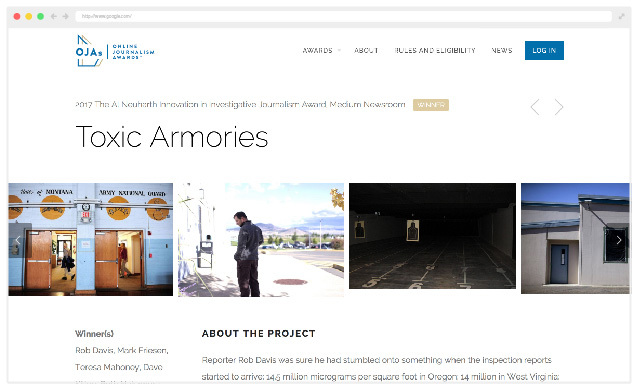 Toxic Armories, from the Oregonian/OregonLive, won The Al Neuharth Innovation in Investigative Journalism Award, Medium Newsroom last year. As web technologies continue to evolve, much of the material on the internet is at risk for changing, breaking or disappearing. Already, many dozens of the 1,599 OJA finalists no longer exist online, and many more don’t exist in their original form. Maintaining access to these projects is crucial. Soon we will introduce a new feature that automatically archives the work of OJA finalists with the Internet Archive using the Archive.org API. It will also pull links for previous finalists that already exist on the Internet Archive. With the new OJA website, the best digital journalism now has a fitting home where aspiring journalists can learn how great journalism is made, and news organizations and producers can easily see a showcase of their achievements. We hope you like it and that it inspires you to produce amazing journalism and to participate in future editions of the Online Journalism Awards. Submissions for the 2018 program will open in early May.